The City of Montreal was home to two NHL teams during a good chunk of the league’s formative years in the 1920’s and ‘30’s – The Montreal Maroons and the Canadiens. At the time, Montreal was the financial center of Canada and its biggest city. It was the undisputed center of the hockey universe. The glorious greatness the Habs enjoyed throughout the 1950’s, ‘60’s and ‘70’s helped many hockey fans to forget the tremendous intra-city rivalry that rocked the town from 1924 to 1938. Although most look back on the Montreal Maroons as “the other Montreal team,” they were, at the time, just as prominent as the Canadiens. In their day, the Maroons won as many Stanley Cups as any other NHL franchise, including the Canadiens. They either established or played a key role in some of the NHL’s greatest moments. It’s not a stretch to say that with a few more key goals here or there throughout their relatively short history, the Montreal Maroons could have been remembered as one of the NHL’s greatest teams of all-time. Read on, you’ll see what I mean. The first ever pair of NHL games were played December 19, 1917. The Montreal Canadiens beat Ottawa 7-4 and the Montreal Wanderers beat Toronto 10-9. The two Montreal teams of the day were aligned along linguistic communities, the Canadiens representing French-speaking Montrealers and the Wanderers being Montreal’s English team. Soon into the NHL’s inaugural season, the Wanderers were forced to fold after their arena burned down. This left the NHL with three active teams and one dormant franchise in Quebec City. By 1924, the NHL was ready to expand. Two new teams were added, including the first ever American-based team, the Boston Bruins and a new franchise for the English-speaking community in Montreal to be officially named The Montreal Professional Hockey club. 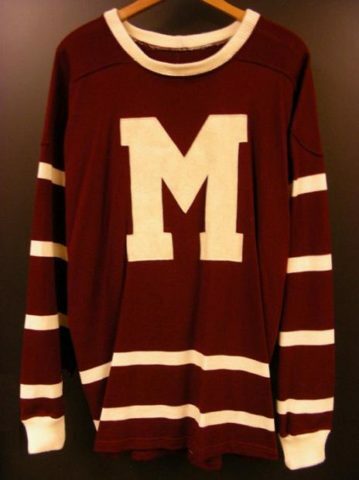 The Montreal Gazette of the day proclaimed, “Montreal will have two teams, One French-Canadian and one British-Canadian.” The team was later nicknamed the Maroons by the media because they wore maroon sweaters and stockings. They only formally adopted the name Maroons well into their first season. On December 1, 1924, the Montreal Maroons were participants in the first-ever NHL game played on American soil. They lost 2-1 to their expansion counterparts, the Boston Bruins. It was, however, those first-season games against their intra-city rivals, the Stanley Cup champion Canadiens, that solidified the Maroons’ special place in NHL history. New attendance records were set with each subsequent game. The Montreal Forum had been built specifically for the Maroons and served as their home arena while the Canadiens continued to honor their lease at the old Mount Royal Arena. Fans lined up for tickets outside and around the Forum and standing-room only crowds packed the building. The games themselves were mini-wars with blood-letting on the ice as well as in the seats between partisan spectators. It was around this time that the NHL established itself as the number one professional hockey league in North America. The Montreal Maroons were founded with the money of wealthy Canadian investors. The Board of Directors included many of the most prominent Canadian businessmen of the day. The players were relatively well-off too. They thought nothing of lighting their fat cigars with $10 bills. The team soon developed a reputation as a cool, arrogant bunch that cared only about winning and the money that came with it. They were also known as a mighty, truculent, powerful and swashbuckling hockey crew. They were a colorful lot and a most important part of a professional game that was still looking to establish credibility as a viable business. Before their 2nd season, the Maroons signed a young star who was born in Montreal but grew up in Toronto. The Toronto St. Pats also coveted Nels Stewart, the 6’1”, 200 pound (enormous in those days) budding NHL superstar, but the Maroons had deeper pockets and lured him to Montreal. The next season, Stewart won the scoring championship and the Hart trophy as the NHL’s MVP. He also guided the Maroons to their first Stanley Cup in just their second year of existence, scoring 12 goals in 10 playoff games. Nels Stewart rivaled Howie Morenz of the Canadiens as the greatest player of his era. The Montreal Maroons won the Cup again in 1935 in spectacular fashion by going undefeated in the playoffs. One or two more lucky bounces in some of the years between their Cup victories of 1926 and 1935, and the Maroons might have secured their place in NHL history as one of the greatest-ever teams. As it was, they fell just short of such recognition. There were too many near-misses, too many times when expectations were higher, particularly in Montreal where second best status in hockey was unacceptable. 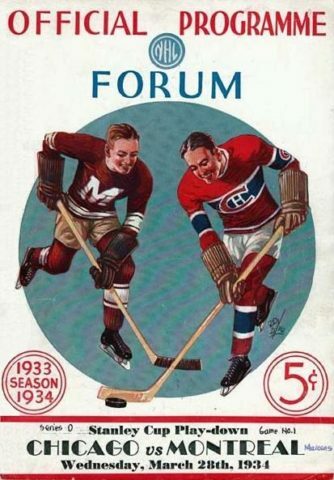 – On March 31, 1927, the Maroons and their cross-town rivals, the Montreal Canadiens were deadlocked at one goal apiece going into Game 2 of their opening round, two-game, total-goals playoff series. After three more periods and at the end of regulation time that evening, neither team had scored since Game 1. It was a thriller of a game with superb goaltending at both ends by future Hall-of-famers, Clint Benedict and George Hainsworth. 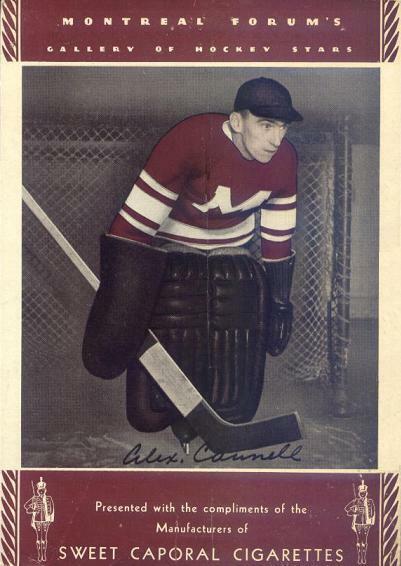 Howie Morenz scored at 12:05 of the first overtime period and ended the Maroons season. – On April 7, 1928, the Maroons blew a glorious chance to go up 2-0 in the Stanley Cup final against the New York Rangers. At the beginning of the second period, Ranger goalie Lorne Chabot was severely cut and could not continue. 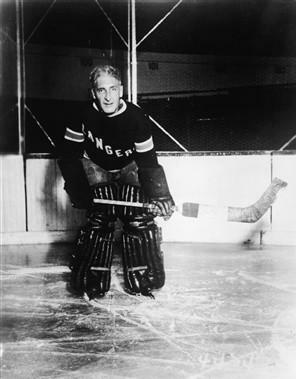 New York’s 44 year-old coach and General Manager Lester Patrick strapped on the sweaty and blood-soaked goalie pads and backstopped the Rangers to a 2-1 overtime victory. Patrick became the hero as the Rangers won the series 3 games to 2, including another 2-1 win in Game 5. 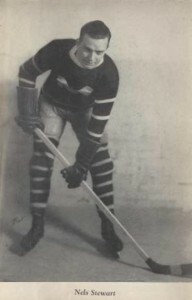 – The Maroons finished the 1929-30 season in first place in the Canadian Division and met the Boston Bruins, leaders of the American Division in the first round. The Bruins won the best-of-five series in four games, but not before a triple-overtime victory in Game 1 and a double-overtime loss in Game 3. The series seemed to exhaust the Bruins and the Montreal Canadiens stole the glory by defeating Boston for the Cup. – In their 1932 semi-final against Toronto, the Maroons season ended much as it had in 1927. The Leafs needed an overtime goal in Game 2 of their two-game, total goals series to extinguish the Maroons. – In 1934, the Maroons won a playoff round against the Rangers before being eliminated by the Chicago Black Hawks, the eventual Stanley Cup champions. By 1938, the Great Depression had taken its toll and the NHL was shrinking from its peak of ten teams down eventually to six. 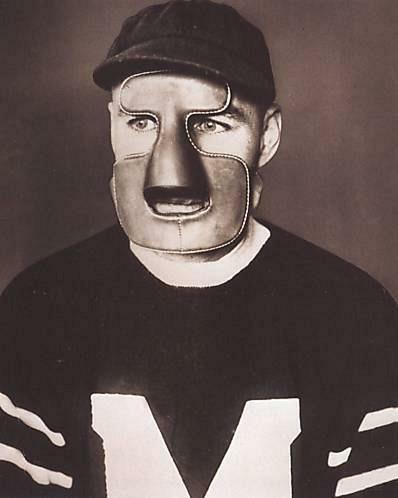 It became evident that Montreal could no longer support two NHL franchises and the Maroons disappeared. In their brief 14-season history, the Montreal Maroons made the playoffs 11 times and won 2 Stanley Cups. Not tremendously great, but not too shabby either. They had several great players, many of which have been honored in the Hall of Fame. On March 24, 1936, they duelled the Detroit Red Wings for 6 overtime periods before finally losing 1-0. It remains the longest game in NHL history. It was one outstanding story after another with the fabulous and colorful marauding Maroons of Montreal.